Tim Bost exposes the essence of legendary astro-trader W.D. Gann's Law of Vibration in this 76-page paperback book. Get it here at wholesale prices; it can be ordered in units of 12 books each. 100 years ago, the legendary trader W. D. Gann used financial astrology to pinpoint prices in his market forecasts, and reportedly made over $55 million in his lifetime. 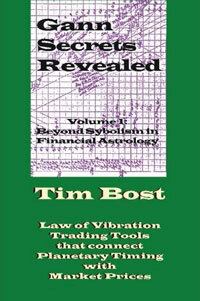 In this book Tim Bost exposes the essence of Gann's work to make tools derived from the Law of Vibration accessible to traders who want a winning edge in the markets today. This is the updated and expanded version of Tim Bost's 2003 book, Beyond Symbolism in Financial Astrology: Disciplined Forecasting with Vibratory Resonance & Power Numbers (out of print). In it, Tim explores the intriguing possibility that traditional astrological knowledge can actually be a limiting factor when it comes to understanding the dynamics of modern financial markets. He proposes a systematic, step-by-step approach that allows the astrological market analyst access to the mysteries of the financial markets, yet avoids throwing the baby out with the bath water by maintaining a genuine respect for the rich esoteric lore that has made astrology such a compelling study for countless seekers. This is essential reading for astro-traders, students of arcane knowledge, and serious astrologers who dare to look past the cookbook approach offered by unimaginative basic textbooks. Must be ordered in multiples of 12 for wholesale pricing.